Every good bathroom remodel begins with a chandelier. Okay, I know that's not exactly accurate. However, I sort of fell in love with a chandelier and bought it before I even hired a contractor or had a design plan. When my husband questioned the sanity of that decision, I said reassuringly, "Trust me, honey. I know about these things, and the chandelier is really a necessity." Wow! Where did that come from? It must have been my upbringing in that huge mansion with all its fancy light fixtures. Except that the mansions I lived in were actually a 1970 ranch and a 1979 Colonial, and although I can't recall the exact lighting scheme in each bathroom, I do know neither involved anything dangling from the ceiling. When I found my sweet chandelier at a local architectural antiques store, I knew I had to have her and work her into the room. She has been wrapped up securely in a box in my closet for months, and today she was finally unveiled. I love her as much today as when I saw her hanging from the rafters of the old antiques place. She is the little crown jewel of the room, and I can't imagine the space without her. I love that she has a history to her, and that she'll have a long life ahead of her in our home. Just remember, if my husband ever asks... yes, it is completely normal to start a major remodeling project with the purchase of an antique chandelier. OOOOH SWOON,I am in love! that chandy is gorgeous. I cant wait to see the room in all its glory. I love it, C!! total eye candy!!!! What a beauty! 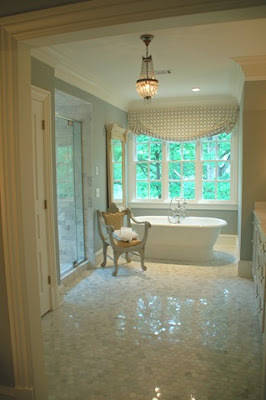 I'm afraid that if I had a chandelier in my bathroom, I'd be knocked unconscious. I think picking out a chandelier first is a very logical place to start (said for your husband's sake). Your posts make me laugh out loud! She sure is pretty! Nice job. Thanks for joining in my newbie party. Glad you figured it out. Have fun makings some new friends. Wow, that is beautiful, and I love all the bathroom pictures you shared! I found you at Debbie's Party. I am your newest follower, and would be thrilled if you would follow me back. I am excited to see more of your fun projects! That bathroom is so gorgeous it DESERVES a chandelier!! Simply divine!! I'm here from Debbie's party, and I'm also your newest follower! Really pretty, and the white just shows it off! You had me at the chandelier. I am a big lover of chandeliers - your chandelier is just gorgeous and it is the perfect lighting for that stunning bathroom. I am your latest follower. I would love for you to come and check out my blog and follow me back at www.diybydesign.blogspot.com. Thanks so much. That chandy is gorgeous! Your bathroom is looking so pretty. I agree that the light is the crowning jewel. Just found your blog via Debbie's newbie party. I'm your newest follower and would be delighted to have you follow me back. Truly fabulous!!!! What a gorgeous bathroom. Of course it is normal to base things around the perfect light! Kind of like finding fabulous accessories before you pick out the dress. :-) I just found your blog through Debbie's newbie party and love it! You have fantastic taste and I'm enjoying looking through your posts. Pop over and say 'hi' if you get a chance (we have a giveaway going on) and I'm now a new follower! found you through debbiedoos and am following. hope you take a look at my blog and join in the fun! I'm totally with you on the necessity of having a chandelier purchased well in advance of any renovation. I can see why you fell for that one - it is gorgeous. I wish I could find one like that for our bedroom. Chandeliers in bathrooms do look great but often small rooms do not have the ceiling height necessary for a chandelier unless you do not mind ducking!